Now cut at 45 RPM on 4LPs! 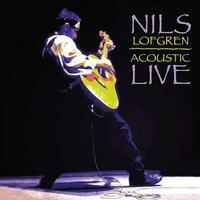 Guitarist and singer-songwriter Nils Lofgren in 1997 released a small treasure for longtime fans. Acoustic Live captures Lofgren alone in front of an appreciative audience, knocking out such favorites as "You," "No Mercy" and "Keith Don't Go," plus six new songs. Even with the new songs, there are no real revelations, only a selection of little gems that will put a smile on your face as you listen. Yes, this is a digital recording. True to our company principles, Analogue Productions in almost all cases reissues recordings only where the analog master tape is available. However, there are rare exceptions that whether digitally recorded or otherwise, a recording is so outstanding it's worthy of the highest quality vinyl reissue. Now with Analogue Production's 45 RPM release, the best-sounding version of this classic double album gives listeners an even richer sonic experience. The dead-quiet 4LP set, with the music spread over four sides of vinyl, reduces distortion and high frequency loss as the wider-spaced grooves let your stereo cartridge track more accurately. Along with his work as a solo artist, Lofgren has marked more than 25 years as a member of Bruce Springsteen & The E Street Band as well as a former member of Crazy Horse and Grin. Lofgren joined Neil Young's band in 1968 at age 17, playing piano on the album After the Gold Rush. Lofgren would maintain a close musical relationship with Young, appearing on his Tonight's the Night album and tour among others. He was also briefly a member of Crazy Horse, appearing on their 1971 LP and contributing songs to their catalogue. From '71 to '74 Lofgren was active in Grin, the band he founded in '69. Solo albums and tours followed every year through the 1970s as Lofgren established himself as a top guitarist and live performer earning the respect and acclaim of his peers. Bruce Springsteen made the call in 1984 and Lofgren joined the E-Street Band for the Born in the USA tour. Lofgren was an instant hit with Springsteen's fans through his playing and vibrant on stage persona. Lofgren remains a stalwart of the E-Street Band to the present day.